An intervertebral disc is a fibrocartilaginous structure between 2 vertebra (spine bones). The discs can sometimes bulge out of place and put pressure on the nerves in the spine. This can also be referred to as disc herniation or protrusion. 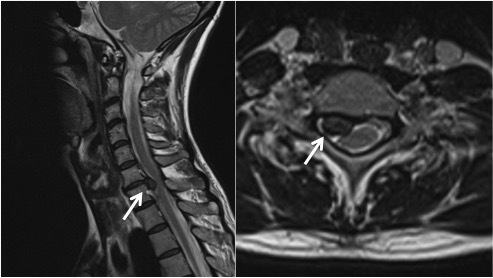 A disc protrusion (white arrows) at C6/7 causing nerve compression. Compression of a nerve in the spine interferes with its function and may cause pain, numbness, or weakness. Brachalgia is pain in the neck, shoulder and arm, caused by pressure on nerves in the neck. The most common cause is a disc protrusion. Surgery is sometimes needed to remove pressure and tension on the nerve in order to relieve symptoms. This is particularly in cases where there is severe pain, pain that is not improving or significant weakness. Send us an email, ask us a question, find our location, get in touch, telephone for more information or to book a consultation.